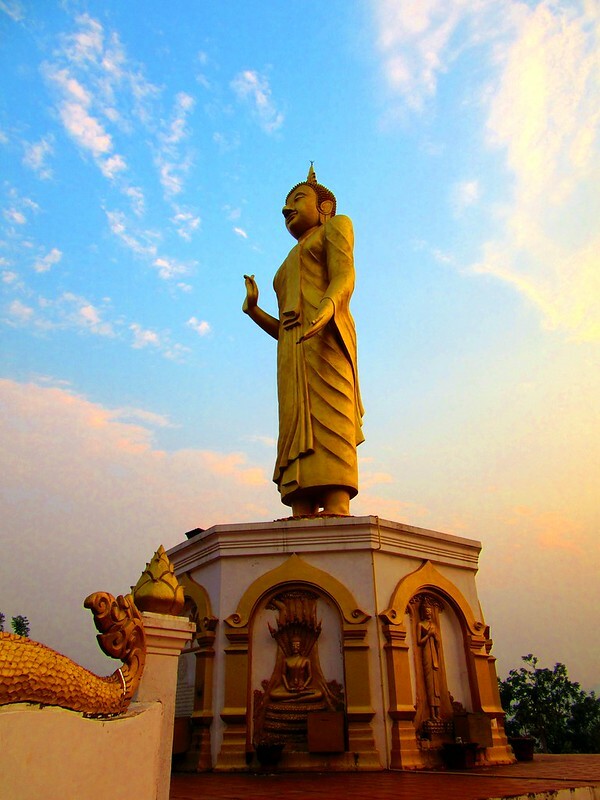 Starting off, Vientiane isn’t the most interesting of capital cities but we did enjoy a relaxing few days of good (but quite expensive) food and lots of BeerLao. It was a nice way to get over leaving our beloved Thailand. Heading away from the city the roads were pretty good and they have continued to be throughout the part of Laos we have cycled. We were quite surprised as some of the other blogs we have read said there were bad patches. It made the climbs easier, plus all of them are at such a great gradual gradient (say that quickly after a few BeerLaos) that they really weren’t as scary as I had imagined. That doesn’t mean they haven’t been tough but with the stunning views it made it all worthwhile. Then the real fun starts when you get to whizz back down. The longest downhill being over 20km, it was so surreal. I gained a lot of confidence riding down those. We loved them. The majority of time the road was pretty quiet even with us following the main highway the whole time. It was only a single laned road with no markings. We felt safe and trusted the other drivers. 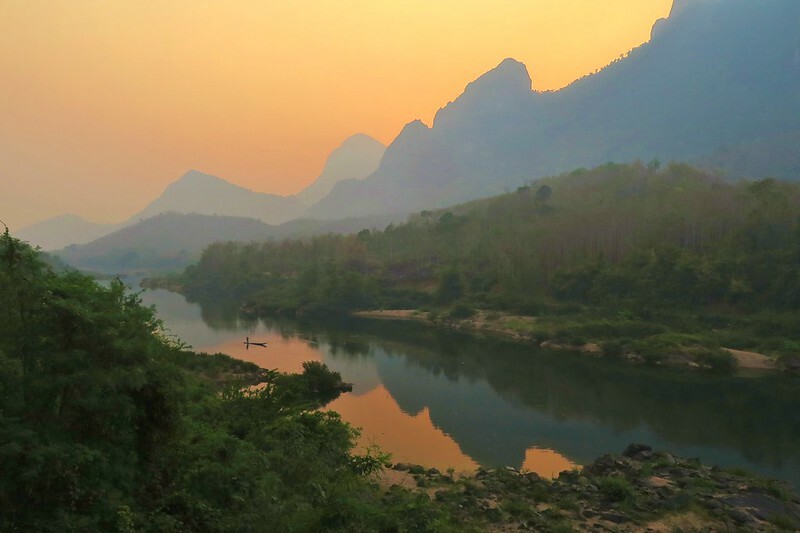 We have read/been told by numerous other touring cyclists that the stretch we rode between Vang Vieng and Luang Prabang was the best part of their trip in all of SE Asia. We therefore had high expectations but it was all true, it was one of the most beautiful and mesmerizing places to cycle. I can only imagine it on a blue bird day with no haze in the air. There was so much to look at. 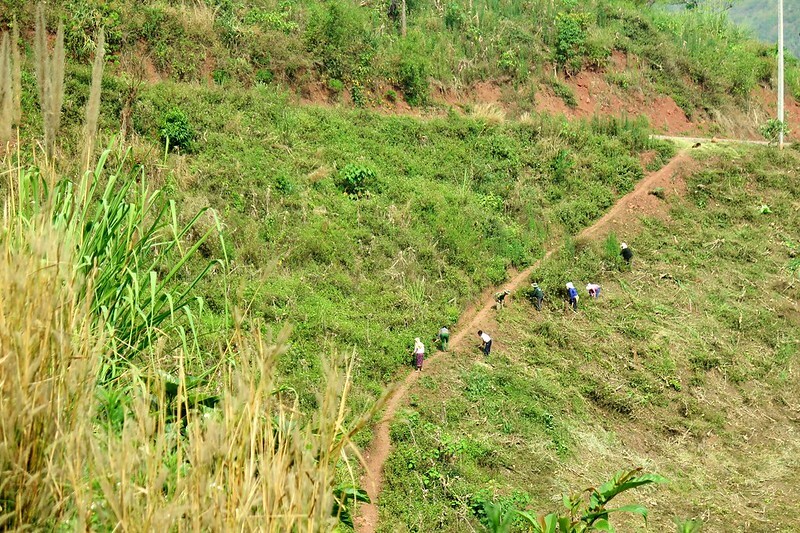 We cycled through so many small villages, high up in the hills. The parents would spot us (easily when we were climbing extremely slowly up) and shout at the children, “Farang, farang!” meaning foreigner. Then these adorable, extremely young children would wave and say,”Sabaidee” (hello) or “Bye Bye” not sure why goodbye but we went with it. There were a few of the slightly older children who would stand at the side of the road for a high five. They were brutal though and would try and whack your hand as hard as they could. Not quite as fun. 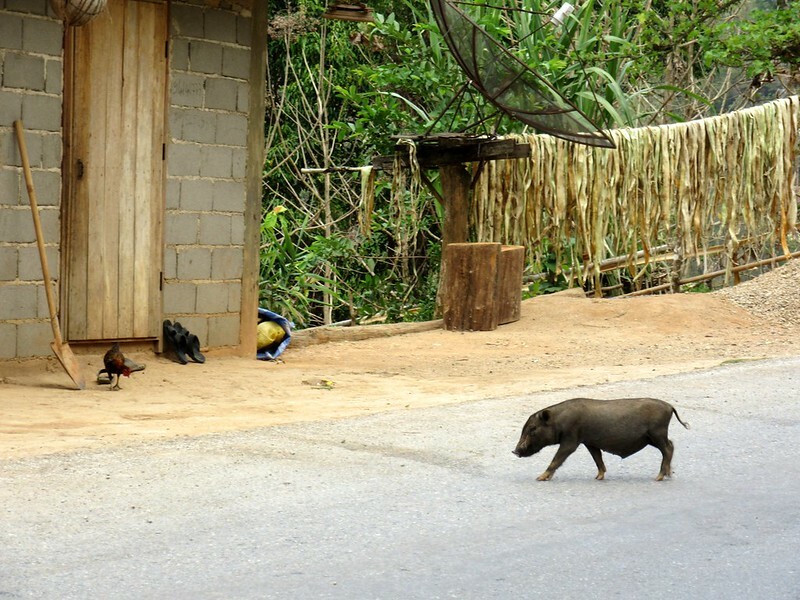 There were also chickens, ducks, pigs, puppies, goats, horses etc in these villages. It was incredible to watch them all getting on with their daily routine. A completely different world, and a much harder one than the one I’m used to. The weather has been sunny pretty much the whole time we have been here. So we stuck to our early morning starts and trying to be done by lunch time routine. It’s worked well for us and means we have the whole afternoon and evening to explore where ever we end up or just relax. On a couple of occasions there has been rain in the late evening/night. The first time it happened we didn’t know what was going on, it had been that long since we’d seen or heard any rain. Food as I’ve mentioned is always a big part of our enjoyment of travelling. 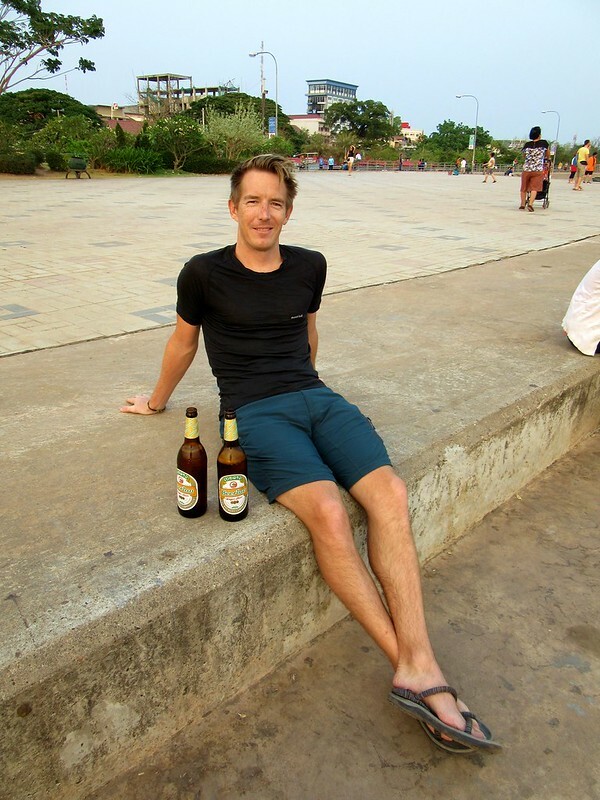 So it was great to be in the cities, Vientiane, Vang Vieng and Luang Prabang. 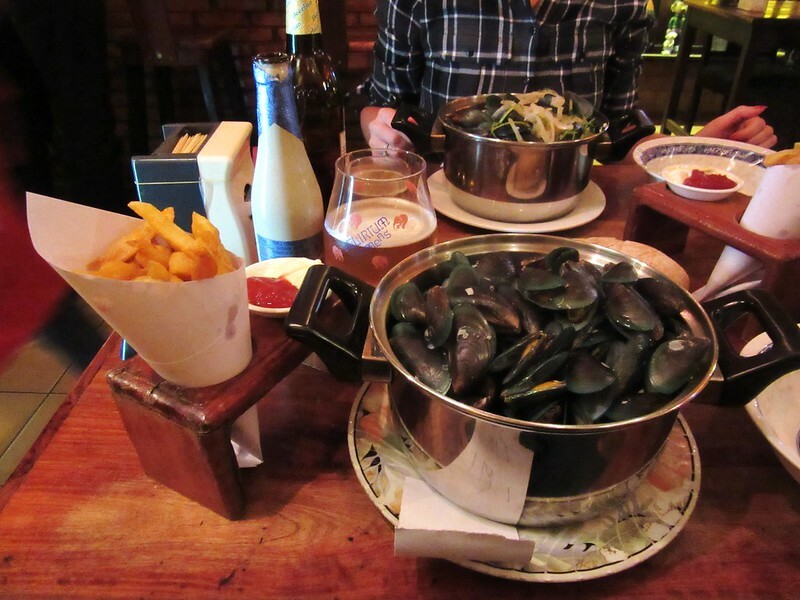 We stopped in each for a couple of nights and definitely made the most of western food. Luang Prabang had such a lovely feel to it and I’m sure we could have stayed longer. The food otherwise has been a little hit and miss. We enjoyed a lot of it but we have definitely had a few more disappointing meals. As Andy mentioned before I made the mistake of ordering a pig trotter at the steep price of 60,000 kip (£5). I was imagining lovely braised pork in a delicious sauce, the reality was gristly toe nail. I’m sure that descriptions made you hungry! Oh well a lesson learned, the translation is never precise. Sadly no picture but here’s a FFF picture. 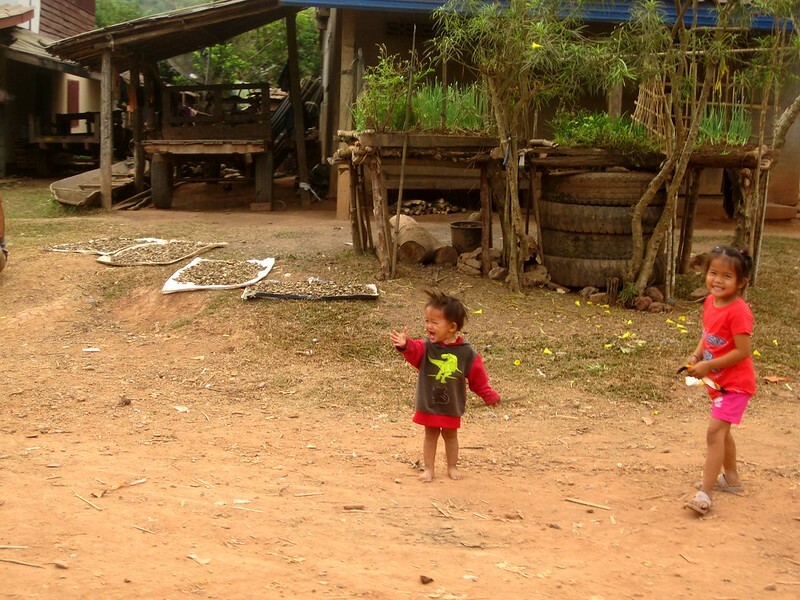 We have different highlights for Laos. 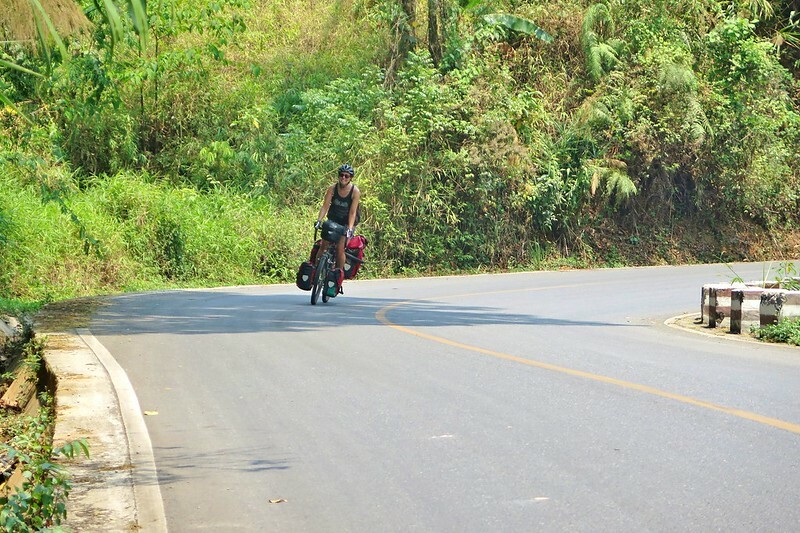 For me I enjoyed our last day riding into Luang Prabang and the 20 plus km we enjoyed downhill, which Andy loved too. 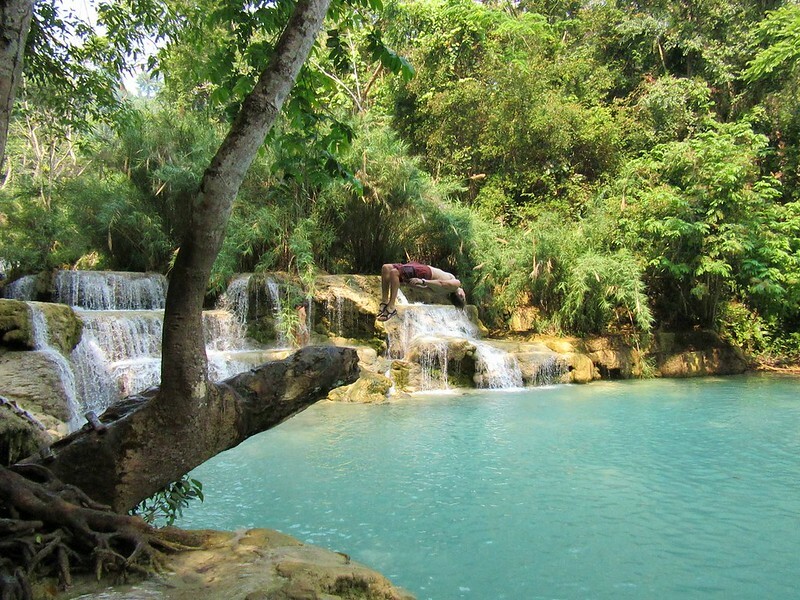 But his highlight was when we did a 60km loop to some stunning waterfalls near Luang Prabang. The colour of the water was amazing and it was a really fun day. Plus I did eat a delicious grilled fish and sticky rice there, which makes it doubly good. The bad, we’re struggling to think of much. The disappointment of false summits, they’re a bugger! I guess the dust, especially when there are a lot of trucks on the road. 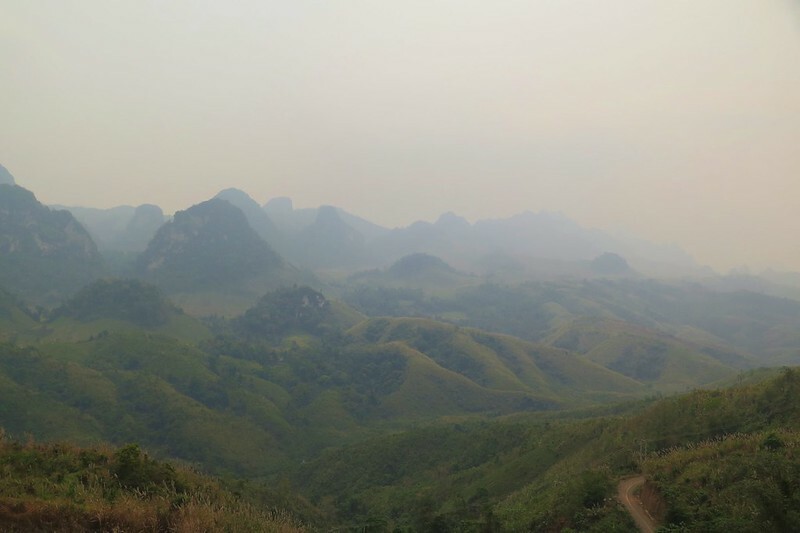 The haze in the sky on a couple of days when we know it would have been a stunning view but you can’t see anything. 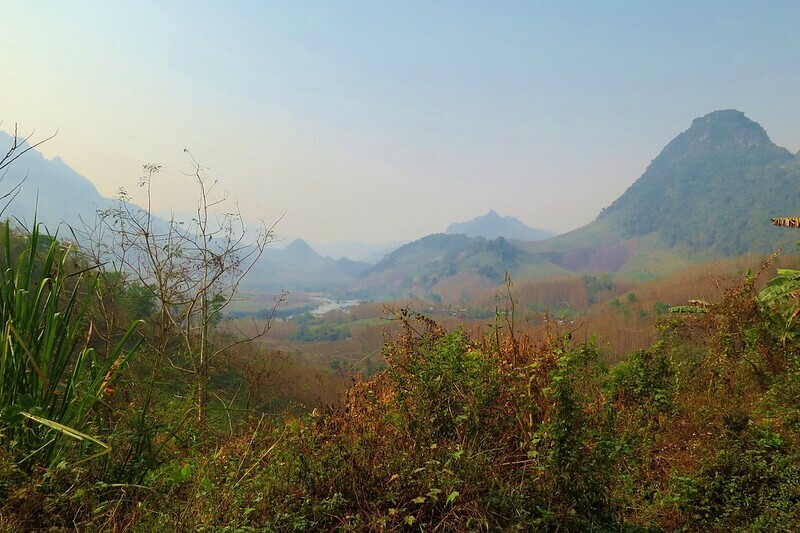 On the whole Laos has been a great place to cycle through. 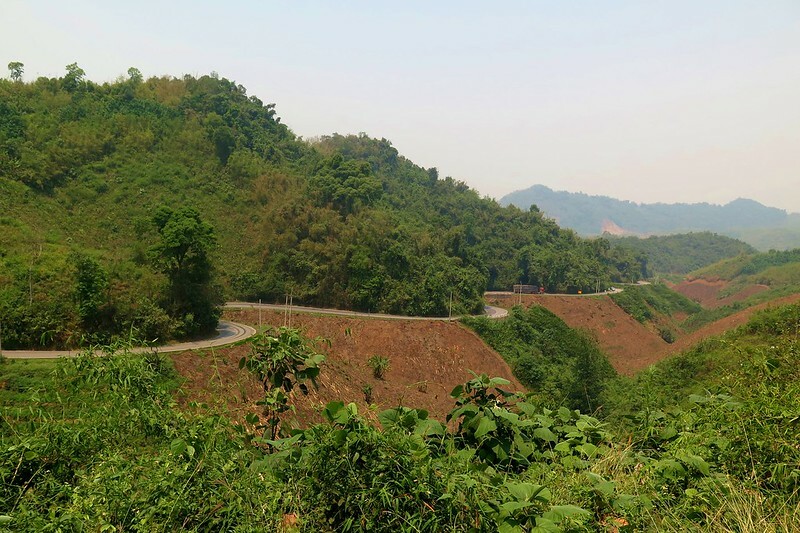 It has given me a bit more confidence for the climbs ahead in other countries as many cyclists say Laos is a very challenging place to cycle with the hills. It is another country neither Andy or I have visited before and would definitely recommend to people to visit. A beautiful place and some incredible memories to add to our collection.